The Alghero airport ‘Riviera del Corallo’ (AHO) is a small airport close to the town and operated by many flight companies: Alitalia, Airone, Meridiana and Ryanair. Inside the airport you may find the Bar Sarda Caterers (located in the tunnel between arrivals and hall), ATM, telephone service,shops like Alta Marea, Ichnos (Sardinian handycraft – typical food, located in the departures) and Kokkos (typical food). The luggage storage is not present. Find out more about Alghero with our small travel guide. 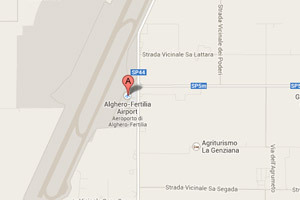 Real time flights information for the Alghero Fertilia airport ‘Riviera del Corallo’. Arrivals and departures timetables for Ryanair, Alitalia and Airone.